The Trek Collective: Frisbee USS Enterprise should be real! As if ThinkGeek aren't already creative enough with their weird and wonderful products, on April Fools' Day (yesterday) they like to go a little further, and come up with some extra implausible goodies to tempt us with. This year they had two Star Trek creations! Each Star Trek U.S.S. Enterprise Flying Disc is pretty much just what it looks like. There's the saucer section (made of space-age plastic) which is the part you throw (just like a regular flying disc). But the Star Trek U.S.S. Enterprise Flying Disc also has the rest of the ship attached (made of foam). The saucer section spins freely, and the secondary hull actually stabilizes and flies behind it. The result? A U.S.S. Enterprise you can easily throw and catch. The Star Trek U.S.S. Enterprise Flying Disc - it's the most fun you can have without anti-gravity, a bottle of Saurian brandy, and four Tribbles! The potentially exciting thing about ThinkGeek April Fool's products is that they don't always remain jokes. As well as being a bit of fun, ThinkGeek carefully monitor the interest in the ideas, and sometimes bring the more plausible ones to life. You can even vote for the ones you like most (there are seven other besides these Star Trek ones this year). These two are so plausible there are indeed already similar products out there. 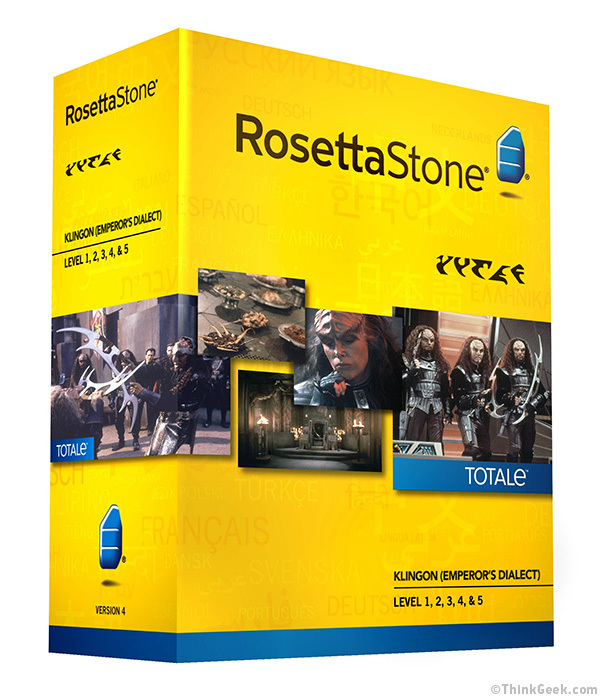 There have of course been numerous Klingon language books and learning guides over the years, including a CD-ROM language course from EuroTalk. There's been nothing quite as elegant as the idea of turning a frisbee into the Enteprise, but flying models aren't unheard of. A few years ago Mattel released a propeller driven remote control model, and perhaps even more out there than what ThinkGeek propose, many years ago Estes released a model you could build around a rocket! 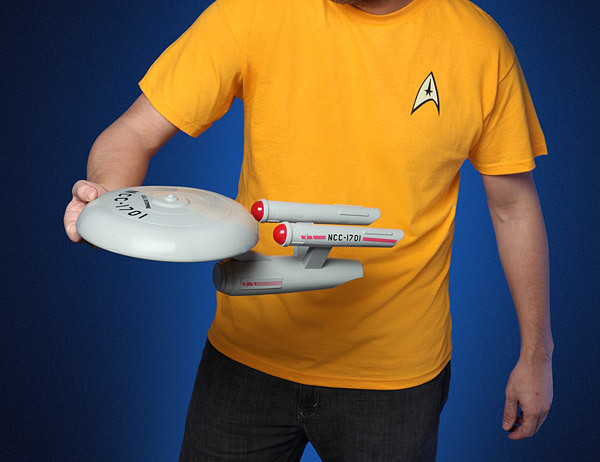 I think the ultimate flying Enterprise would be a frisbee one though, so lets hope ThinkGeek can make it real! Let's hope ThinkGeek have more success in bringing this to market than Galoob did! Awesome! Well, if the Galoob one actually flew, there's hope for ThinkGeek to pull it off!